Sitting at my desk today I’ve been hearing the voices of tango singers floating up towards my 7th floor balcony. With hundreds of other apartments visible from my window I assumed a neighbor had taken on a new obsession & had started a practice of playing the stereo extremely loud. Eventually a slight tone made me realize that this was no recording but live music. How I’ve not kept up with the happenings around town. The annual tango festival is taking place. A quick visit to the city’s website revealed that the focus of today’s events are at the amphitheater in Parque Centenario. The entrance to the theater is a direct line of sight from my balcony. If I didn’t have some very pressing matters at work then I would hop over to the festival. Meanwhile, I’m listening to music from afar. It’s quite enjoyable to have the sounds of live tango drifting into your Buenos Aires apartment. I’ve written before about the great voice of Mercedes Sosa. Now via youtube you can see and hear Mercedes Sosa performing the beautiful “Gracias a la vida”. The performance must be about 25 or 30 years ago but her voice is still as good today as it was then. The quality of this video is very good. Also, for the Spanish impaired, there are subtitles to the lyrics. While the subtitles are in Spanish you should be able to figure out the meaning of the lyrics of “Gracias a la vida”. The song was written by the Chilean Violeta Parra, who committed suicide in 1967. National Geographic has a brief bio of Violeta Parra on its world music site. Saturday night we went to the park in Palermo to see Mercedes Sosa perform. It was a free concert on a nice summer night, so there was a huge crowd. It wasn’t the Stones in Rio but it was still a lot of people. I’ve written before about Mercedes Sosa where I talked about seeing her in Miami Beach a few years back. At that show I had a seat on about the 10th row; last night, it seemed like we were on about the 500th row. But we really enjoyed it anyway. She had a number of guests who came onstage to sing with her, including Diego Torres. But the big surprise of the night was Charly García who joined Mercedes Sosa towards the end of the concert for three songs. 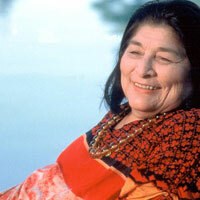 July 9 is not only Argentina’s Independence Day but today is also the 70th birthday of singer Mercedes Sosa . Mercedes Sosa is one of the most well-known singers from Argentina. She sings folklore, songs of protest and social concern that were inspired by her native heritage and her roots in the provinces. In the 1970s her songs were censored by the military dictatorship ruling Argentina. She went into exile in 1979 until 1982 when the the dictatorship ended. Since the 1960s Mercedes Sosa has performed throughout the world at top venues including Carnegie Hall in New York City. I was fortunate to see Mercedes Sosa perform in Miami Beach a couple of years ago at the Jackie Gleason Theater. I had gotten seats fairly close to the front and it was an incredible concert. For weeks afterwards, I had one of her CDs in my stereo set to wake me up every morning with the sound of her voice. Read these reviews of her concert performances, from London’s Guardian and from Colombian singer Marta Gomez who writes a wonderful entry about Mercedes Sosa, for whom she opened the concert at Boston’s Berklee Performance Center in 2003. At 70 Mercedes Sosa is not performing so much anymore but if you get a chance to see her in concert then you definitely should go. If you don’t own one or more her albums, then go get one today.